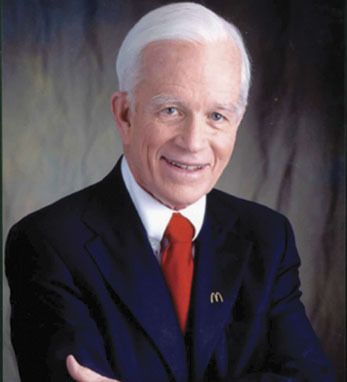 Besides his role as chairman of Schwarz Supply Source, an international distributor of paper packaging and allied products, Andrew McKenna is also non-executive chairman of McDonald’s Corporation. Additionally, he serves as a director of the AON Corporation and the Chicago Bears Football Team and Skyline Corporation. Over the years, McKenna has served on many civic boards. He is a director of The American Ireland Fund, Children’s Memorial Hospital of Chicago, the Big Shoulders Fund of the Archdiocese of Chicago, The Ireland Economic Advisory Board and the Lyric Opera of Chicago. A graduate of Notre Dame with a B.S in business administration, McKenna was awarded the university’s Laetare Medal in 2000. He served as the chairman of the board of trustees from 1992-2000 and continues on the board today. He is also a graduate of the DePaul University Law School where he received a Doctor of Jurisprudence. A second-generation Irish-American, McKenna has roots in Mayo and Monaghan. He and his wife Joan have seven grown children and 23 grandchildren.